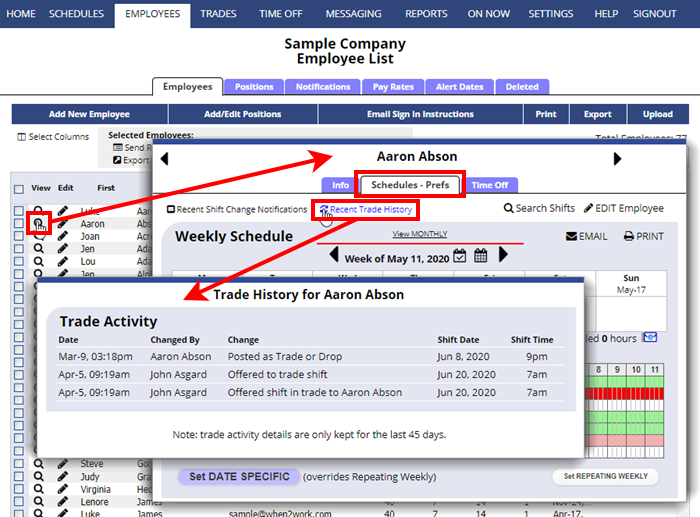 We do not currently provide a log or history of all trades posted for all employees, but you can see a list of trade details in two places – for each employee in their “Recent Trade History” (below), or for each shift using the “Shift History.” These show the trade details for the last 45 days. You can also run a report to export the contents of the ‘Shift History’ for any date range. That is, each Shift History contains recent changes, and those can be put together and printed or exported. Simply select the date range of the edits you are interested in seeing, and run the Export Recent Shift History on the REPORTS page, and this report will give all changes made in that time frame. Note that our system only keeps changes made in the past 45 days, so this report is only accurate to 45 days back. If you were to run this report every 30 days, you could create an archive of Shift History changes in your account, including trades and also edits, etc. You can find the trade details for a particular shift for the last 45 days by clicking that shift in the schedule and then clicking the “Shift History” link in the upper right.